DownWithTyranny! : Major Political Explosion In Chicago! Jan Schakowsky (D-IL) has a great voting record-- pretty much as good as it comes. ProgressivePunch rates her record a strong "A" and she's one of only 6 members of Congress this cycle with 100% scores (along with people like Barbara Lee, Jim McGovern and Jamie Raskin). When it comes to politics, though... she's on a different path, more often than not backing crappy DCCC/EMILY's List candidates who aren't nearly as good as she is on issues. One of the best grassroots activists in Illinois described her to me like this yesterday: "Schakowsky is a progressive on policy and establishment politically" and when I asked him why, he said "She is part of the good ol boy network... Pork for the district, her legislation moves forward, etc. All of these clowns are there for their own survival." Example: in IL-14, Randy Hultgren's Chicagoland seat primarily in McHenry, Kane and Lake counties she-- along with New Dem Bill Foster-- endorsed Matt Browley, a Republican pretending to be a Democrat. He's the establishment pick running against the grassroots progressive in the race, Jim Walz. But how about an opposite example-- one that shows Schakowsky as the most amazing progressive fighter in Congress? This week, she and Luis Gutiérrez (who is retiring) did something no one ever does in Congress-- they endorsed a challenger and reformer against one of their own colleagues in a primary. No one does that. Pelosi and Hoyer come down on anyone who even thinks of doing that like 2 tons of bricks. 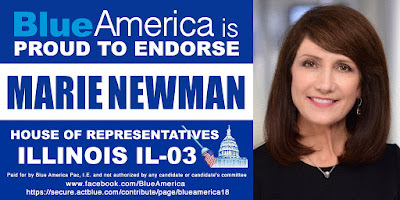 But Schakowsky and Gutiérrez both announced they are backing progressive reformer Marie Newman in her tight primary race against reactionary and bigoted Chicagoland Blue Dog Dan Lipinski. In Marie's own words: "It’s hard to overstate how big a deal this is. These two leaders know Dan Lipinski better than anyone, and they’re tired of seeing one of their fellow Democrats vote with President Trump and against the values of the Third District’s voters. They’re saying Marie Newman can do better. And they’re saying she can win. Just look at the fight playing out on Capitol Hill right now. The vast majority of Democrats are banding together to stand with Dreamers, innocent young people who were brought to this country as children—many of whom know no other home. This fall, President Trump announced he would end DACA, which President Obama put in place to protect Dreamers from deportation. Just this weekend, he rejected a bipartisan deal that writes these protections into the law. 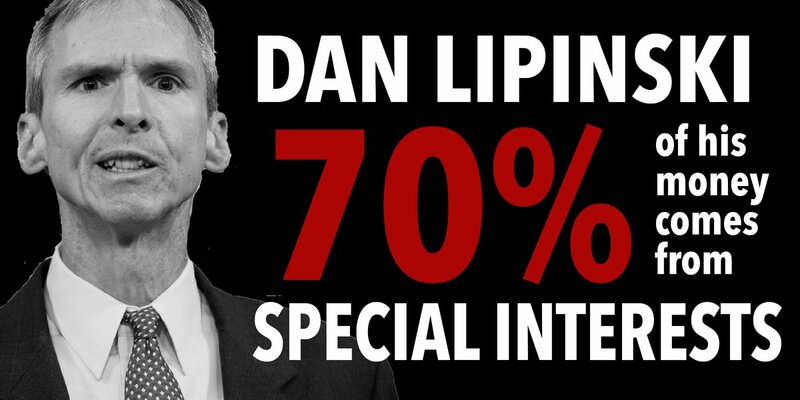 We can’t count on Dan Lipinski to do what's right for Dreamers. After all, he voted against the DREAM Act and holds positions on immigration that look a lot like Trump’s. This is why Reps. Schakowsky and Gutiérrez are eager for a new voice-- someone who will stand up for Dreamers and fight discrimination of all kinds. Voters in IL-03 want change, not more status quo politics. In the presidential primary they backed Bernie who beat Hillary." Chicago's most credible political journalist, Lynn Sweet, wrote in Wednesday's Sun-Times that the move by Schakowsky and Gutiérrez "a rare break from the usual tradition of House incumbents either backing each other or staying neutral in a primary." Gutiérrez pointed out that "It’s not easy to endorse a challenger over a colleague in the House of Representatives, especially when that colleague is a member of your party... “Primaries are about definition of a party. I want to define myself with Marie Newman, and I hope the Democratic Party does too." Schakowsky made it clear the move wasn't personal but about issues. 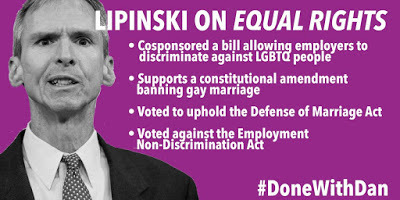 Lipinski has been wrong on almost everything important to Democrats and has been especially egregious on Choice, health care, immigration and LGBT issues, where he virtually always votes with the Republicans. The DCCC and its corrupt conservative allies, like the Blue Dogs, New Dems, EMILY's List and the corrupt segments of the labor movement, will move with speed to counter Schakowsky and Gutiérrez and do what they can to prevent any kind of groundswell to develop for Newman. 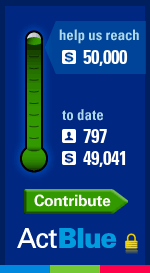 If you'd like to help Marie replace one of the absolute worst fake-Democrats in Congress, please consider clicking on the Blue America Primary A Blue Dog thermometer on the right and contributing what you can. When Blue America endorsed Marie 7 months ago, she explained in a guest post why she's running and what her priorities will be in Congress. First, we must fight to protect and extend health care for all Americans. I believe the best way to do that is through phased-in approach to include some of the key proposals out there currently such as the Medicare for All initiative, introduced by Congressman Conyers and Senator Sanders. Until we have a President and Congress that will pass such a measure, we must fight to protect the Affordable Care Act from repeal. This includes retaining the elements of that law focused on women’s healthcare and reproductive rights, protecting Planned Parenthood and the millions of women it serves, and requiring insurance companies to cover those with pre-existing conditions. 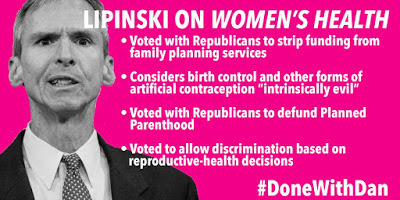 Not only is my opponent the only Democrat from Illinois to vote against establishing the Affordable Care Act; he has voted repeatedly with the Republican majority to defund Planned Parenthood. This is an unacceptable assault on the rights and health needs of millions of women across our country. Second, we need to put the needs and concerns of small businesses ahead of the big corporations who use their campaign money and lobbyists to turn the tax code to their advantage. It is our small businesses that create most of the new jobs in our country and that make up the majority of the businesses in the 3rd Congressional District. In any restructuring of our tax code, we need to close the loopholes and special privileges that enable the wealthiest corporations to avoid their fair share of the tax burden and use some of those resources to help small businesses and entrepreneurs. We must also reverse the Citizens United decision, which has given a handful of right-wing billionaires a hugely disproportionate role in our elections and government. I believe every person’s voice and vote should matter the same. My opponent takes three-quarters of his campaign money from Washington PACs and lobbyists, which is why he’s ignored the needs of small businesses without that kind of political clout. As a Member of Congress, I’ll reverse those misguided priorities and focus on promoting small business growth. Third, too many students in our country are leaving college with huge debt but without employable skills. We should encourage the development of high school and college curriculums that actually lead to real jobs. For example, creating more cost-effective entry to community colleges and to create one and two year certifications with designated paths to well-paying jobs that will promote both job and community growth. This should apply to federally supported job retraining and career redirection programs, as well-- many of which could be administered through our community college system. Last night, Natasha Korecki did some further reporting on this for Politico. Other than her refrying to the right-wing conservative Lipinski as "a centrist," there's some worthwhile info in her report, especially about how Lipinski is trying to defend himself. 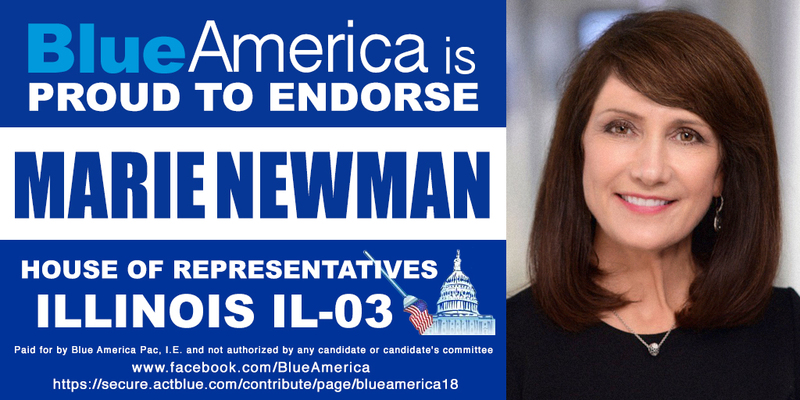 Still, Newman will need all the help-- and money-- she can get against Lipinski, whose family has held a seat in the district for decades. Wednesday’s move by Schakowsky and Gutierrez put them at odds with a more pragmatic [better word would be corrupt] faction of Chicago Democrats-- old guard Democrats who remain loyal to Lipinski’s father, former Congressman Bill Lipinski, and would prefer to leave his son be. 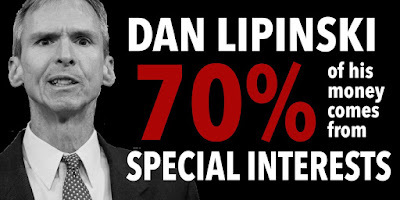 The party, unfortunately, isn't "spending precious resources to oust " Lipinski. Instead, they will spend precious resources to hold a Republican-supprting reactionary in a safe Democratic seat. Just Wednesday, for example, the Republicans passed a resolution top move forward on one of their crackpot anti-choice bills, HR 4712, and every Democrat opposed it except two, one of those two being Lipinski, of course. Jan should also note that the democrap leadershit is against mfa, small businesses and the middle caste and for corporations. So elect the new one or dan or even the R and it's all the same in the end. No change is possible when the leadership of the opposition proclaims proudly, "We're all capitalists here!"